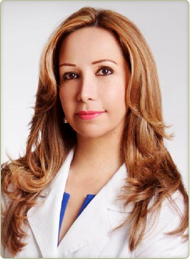 A licensed dermatologist in the UK and in Dubai, with PhD in Dermatology, Dr. Hala Fadli’s medical practice specializes in diseases of the skin, hair, and nails with an emphasis on facial cosmetic enhancement and complexion enrichment. Dr. Fadli is committed to providing quality, state-of-the-art dermatological care in a warm and compassionate environment. Her primary goal is to enhance one's appearance and treat the aging phenomenon so that people can look as good and as young as they feel. Every patient receives individualized attention from Dr. Fadli beginning with an informative consultation and continuing throughout the post-treatment period. The consultation is simply a comfortable exchange of information between a patient and the physician. During your consultation you will have the opportunity to discuss the procedures you're interested in with Dr. Fadli. It also allows her to examine you, take a medical history, evaluate your particular concerns, and offer her candid opinion and make recommendations.